(Enhance Spiritual, Mental, and Physical Wellbeing With A Pineal Gland Detox by Carolanne Wright) A tiny gland in the center of the brain named the pineal may seem insignificant, but researchers have found it to be vital for physical, mental and, many believe, spiritual health. Through poor diet, exposure to toxins, stress and modern lifestyle choices, the pineal gland becomes hardened, calcified and shuts down. To awaken this gland from its slumber, detoxification is necessary using diet and herbs, sunlight and pure water. Pinecone shaped, the size of a pea and resting in the center of the brain, the pineal gland is small but powerful. It secretes melatonin, which regulates sleep/wake cycles, and serotonin, a neurotransmitter that fosters happy and balanced states of mind. Not only crucial for a good night’s rest, melatonin also slows aging and is a potent antioxidant. It helps to protect against electromagnetic pollution as well…. 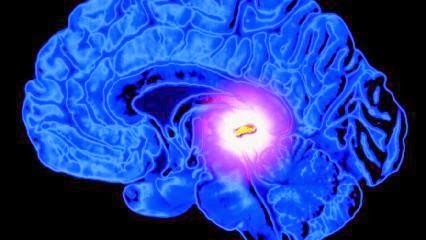 Scientists suspect that N, N-dimethyltryptamine (DMT) is also produced by the pineal gland. This is the substance that gives shamanic botanicals like Psychotria viridis its hallucinatory kick. Dr. Rick Strassman, author of DMT, The Spirit Molecule, believes that the pineal gland produces DMT during mystical experiences as well as at birth and death. DMT is also associated with lucid dreaming, peak experiences, creativity and the ability to visualize. As a result of the aging process and exposure to toxins, the pineal gland begins to calcify. Sodium fluoride is the number one enemy of a healthy pineal gland. This toxin is lurking in the water supply, conventionally grown food and toothpaste. Dietary hormones, mercury, processed foods, caffeine, tobacco, alcohol and refined sugars cause calcification as well. Radiation fields, like those found with cell phones and wi-fi networks, are damaging too. Avoiding these hazards is the preliminary step to healing this gland. The second course of action involves removing existing calcification. Holly Paige of Food for Consciousness, also offers a number of suggestions to help jump start the pineal gland. “Happy Tea” is one. A mixture of passion flower and St. John’s wort, the tea contains pinoline — a monoamine oxidase inhibitor (MAOI). When MAOIs are freely circulating within the system, more naturally occurring DMT is available to the brain — encouraging creative and bright mental states…. Sunlight is also considered ‘food’ for the pineal gland. At least 10 minutes of sunlight exposure is recommended each day. Meditation, chanting and pranayama breathing practices are beneficial to the pineal gland as well.